Ask fellow campers about "Allaire State Park" and nearby attractions. We stayed here for a week because of its location. It is the closest campground to the beach in this area of NJ. Having said that, we will probably not stay here again. It is just not designed for a 30' motorhome. We knew going in there were no hookups, but access to the dump station required contortionist maneuvers. Originally, we were going to use the campground showers and bathrooms, but they were just awful. It was incredibly difficult to get level. This campground is better for small rvs, tents, and pop ups. We camped at Allaire State Park in a Motorhome. Fairly close to the beach and the Monmouth county shore towns of Asbury Park, Belmar, Ocean Grove, Avon, and Bradley Beach. In over 2 years of full timing all over the US where we stay primarily in state parks this is hands down the worst we have been in. It's too bad since there are very few state parks in NJ that will allow RVs over 25' but that was the least of our problems. Add $5/day/pet and $17.50 "service charge" for a campground with no hook ups, no water available (see below) and an unacceptable women's showers. Registration is at a site 3/4 mile BEYOND the entrance to the campground in an area that cannot accommodate large rigs (we are 33' and could not have) The site we reserved (#4) was supposedly big enough for a 33' rig-it was 33'6" long-rutted and sloped, dirt, sand and small branches as a surface; and 11' 9" wide (between trees that would not allow extension of an awning) We were able to change though the site was still sloped-end to end and side to side. First attempt to get water from the pedal operated spigot was unsuccessful. The water spews from the pedal area but not the spigot. 2nd attempt at a further spigot-water still comes from pedal area but also from spigot UNTIL a hose is connected. Then it spews from the pedal area and every other opening on the apparatus-up, down and out, EXCEPT the spigot. The third spigot next to the bathhouse has no water at all. A call to the office brings the "full time maintenance man" within 15 min who proceeds in the face of a pump (#2) apparatus taped from bottom to top, to say "it needs to be fixed." To be fair, he was very nice and took us to the maintenance garage where we were able to fill our tank. The trip to the showers the next morning was as disappointing. 3 showers-2 had only cold and of those 1 no pressure since the shower head. The handicapped shower had warm water for about 10 seconds of the 15 sec push button allotment but ended with lukewarm with water spraying from both upper and lower heads and no control. I don't like to write bad reviews but we could not recommend this place at all. We camped at Allaire State Park in a Motorhome. Nice hiking/biking trails; only 1 or 2 spaces could really take a large rig, park in campground and drive to register if possible if larger than 25-29'; closest propane for inboard fill, seems to be in Tom's River (Modern Propane) Plenty of grocery shopping within 1/2 drive. Camping World 15 min away in Lakewood. I295, Rte 70 and Rte 9 all had major issues with surface (at least this spring) so secure everything as it will rock and roll. Not sure how this park got such good reviews unless it was for location and/or activities. $25/night (for non-NJ residents) and a $5 reservation fee and no hookups. I have to wonder what they're doing with the money, because it's certainly not campground improvements. The bathrooms are clean but in dire need of updating. Broken shower heads, no shelving in sink area, scratched mirrors, etc. Even though they say bears are active in the area, the dumpster lid was broken in half (perhaps the result of the bears?). I only saw staff in the campground twice (and that was probably for cleaning). Noise from the interstate is audible but bearable. I probably wouldn't stay here again. 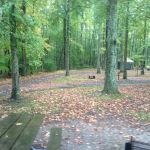 We camped at Allaire State Park in a Travel Trailer. $25 plus a $5 transaction fee for walk-ins. This is a New Jersey State park without hookups but it does have bathhouse with showers which need to be updated. There are only about 55 sites and the ones in the field can take large motor homes but most of the others within the trees and low branches were not a good choice except for those RV's like ours less than 26ft. No pets allowed in the campground but this might change in the next few years. 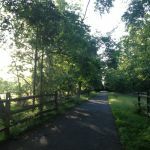 There are hiking trails here and the best part is that the Allaire Village Historic Site is right next to the Park Office. 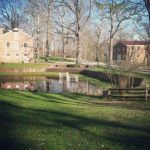 At this time of year they are only open on weekends and charge $5 to park after Memorial Day, yet we parked in there and visitors are allowed and encouraged to walk around all the restored Howell Iron Works Company, Railroad, picnic area and its village. Interesting history! The General Store is open most of the year and the store keeper told us about the history of this village. Some of the buildings were open to look into but with gates up. In the summer interpreters dressed in clothing of that time walk around and answer any questions. There is a Visitor Center with exhibits and many programs offered throughout the summer. It was a beautiful when we were here and we enjoyed our one night stay at this State Park and would return. We camped at Allaire State Park in a Motorhome. 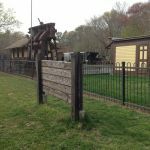 Visit the Allaire Village Historic Ironworks Site in the park. Are you affiliated with Allaire State Park ?